Actress Renée Zellweger spent years fixing up the 1770 farmhouse in Pomfret, Connecticut, that she bought in 2004, but now she’s ready to sell. Her listing agent Jonathan Radford says that Renée’s work and travel schedule keeps her from spending as much time there as she’d like. I love all the windows, the beadboard-paneled ceiling, and the old wood floors. The main house is a Federal-style Colonial built in 1770 but expanded and renovated over the years. Want it? For more photos and information, check the Coldwell Banker listing. Beautiful home and area Julia…and a place to land that helicopter…what more could a girl want? Wow! Doesn’t look like the home of a celebrity, but I love it. I would take that kitchen, no questions asked! So charming! Darn I wish I had 1.5 million lying around! Absolutely lovely. I’m sure the house was cleaned out of most of her belongings for the photos, but everything that’s left works, for sure. I’ve always liked her. And shockingly, I really like her ex’s house, too. At least the one that I saw in a mag several years ago! Pomfret is a lovely town, albeit a very prestigious town in the quiet corner of Connecticut. There are a couple of beautiful boarding schools and some very cool (and reasonable) antique stores. Who knew there was a celebrity living there? Sounds like the kind of place I’ve been looking for! Actually it sounds like a movie type of place, like Funny Farm with Chevy Chase, without the nasty mailman! I do Love that kitchen! Thanks for letting us peek, as always! It does drive me crazy, the whitewashing of every surface, though: this cozy house screams out for era-appropriate soft color and pattern. It can be clean, doesn’t have to be twee, but something needs to happen to pull these rooms together! Beautiful and you’re right–the kitchen is great. 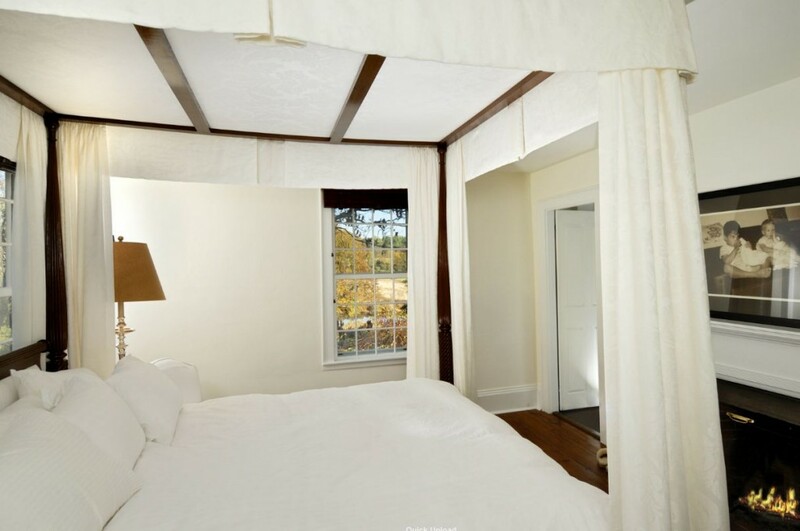 But…that exposed beam over the bed (in the master? )=bad feng shui. If you place your bed under a beam like that, it separates the bed, as well as the two people sharing it. I love it! So cozy, especially that kitchen. Love the planked ceiling and the beams in the bedroom. LOVE it! I seriously want her dining room table. And that stone wall! So pretty. now that is my kind of house! You know, $1.5 million is actually pretty awesome! We have so many huge but characterless homes in my area that are waaaay more. Sadly, I still don’t have even $1.5 mill or a reason to live in Conneticut. But if I did…. If I were Renee, I’d find work nearby so I could live there forever! I think I’ll put it on my Christmas list – it’s perfect – and I agree the kitchen is a treasure. She described my dream. After I watched Funny Farm and Gilmore Girls, I have wanted to move to a small friendly New England town. Wow that library! Wow that master bedroom! Wow that sunroom! And WOW that kitchen! The rest feels blah to me. But a gorgeous house overall. Oh yes adore the kitchen!! A nice large sun room as well!! Come and enter the latest in The 12 Days of Holiday Giveaways from Design du Monde! Amazing that the price is that low for so much land. It’s very nice and would have been fun to see the sun room furnished. Thanks for sharing this house with us. That kitchen is amazing and if I had a country home, that’s the kind I would want. Lovely! Love the HL hinges on the kitchen cabinets. So New England-y ! That seems like an amazing price to me. 39 acres, a gorgeous house and a guest cottage? A recreation barn? This should be snapped up quickly. Now, if we could only find her a nice man. She starts filming Bridget Jones’s Baby in January. Maybe a nice English gentleman? Someone keep her away from Hugh Grant however! Is it just me, or does that price seem insanely low? Sadly, even this bargain is too rich for me, though. Very nice and reasonably priced, however, from the outside the house looks huge, but each room is very narrow. No window treatments, no personality, hmmmm, nice bones, but needs someone to actually LIVE in the house to make it a home. And needs a couple of rooms opened up, felt very choppy, from the foyer on. The grounds and acreage seem very scenic and lovely. Julia, almost 39 acres and the house for 1.5 million dollars? What am I missing? This sounds too good to be true. If I had that kind of money, I’d buy that house in a heartbeat… I love it! I want that kitchen! I think the sunroom will be beautiful refinished. Wow, she has good taste. What a beautiful home. Seems crazy to give that up. $1.5 million is peanuts to Hollywood. Gorgeous house and grounds. Loved the kitchen (but would abolish those blinds forthwith). The blue wall was a non-starter for me, and I’m a big fan of color. I have the feeling she’s long gone and this place was staged. It just doesn’t give off any personality at all. Could spend all day happily in that library…or maybe the sunroom. Tough choice. And compared to California, 1.5 seems like a steal. I’ll pay 1.5 only if Renee comes with the house. About 15 years ago, my husband and I drove through Pomfret and stopped at Pomfret Pizza. It was a lovely little town and the pizza was good too! I still have the magnet in my messy kitchen drawer. The house and grounds look gorgeous. One of the best things about this house is the location/setting. I’ve driven by it a couple of times. If I recall, it’s on a gravel road, in a kind of wooded area, on a bend in the road, nestled up against a small river. There is also a large privacy wall in front of the house, which would add to the seclusion (though I never liked that huge wall because I felt it ruined the “curb appeal” & historic setting. But yes, as a former realtor in that area, I would agree that $1.5M seems quite reasonable.